The swimmers get ready for the start of the race. 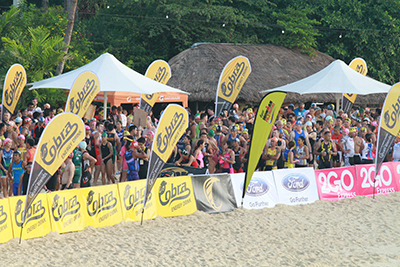 While Cebu has hosted the Cobra Ironman 70.3 four times, I never had a chance to be physically present during the first three editions preferring to stay away from the city or to do something worthwhile at home. This year, I was at the event for the first time due to a few reasons. One, I got somehow involved being one of the commissioners of the newly-minted Cebu Province Sports Commission. I was tasked to attend one of the meetings and then I was asked to accompany Provincial Administrator lawyer Mark Tolentino, a schoolmate from the University of the Philippines College Cebu High School, to Manila for the launching the event at the SM Aura. 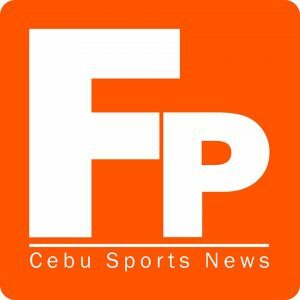 I decided to make sure that I would be there this year to witness the race and cover it for the website and Full Point: The Cebu Sports Show, which airs over myTV channel 30 on SkyCable TV Cebu. I also thought that this would be a good way to get my ideas across to the organizers and hopefully help them in my little way in the process. I ended up going to Shangri La’s Mactan Island Resort for three days starting July 31 to August 2. I was there Friday to attend the welcome dinner hosted by the Province of Cebu. It rained during the event, but the downpour did not dampen the spirits of the participants and the singers and dancers, who came up with a spectacular show highlighting the various festivals of Cebu. One of the differently-abled participants that inspired many. On Saturday, I had to return to the venue to get my media credentials and then slept for only a couple of hours that night to head to Mactan very early to avoid the road closures during the big day. You already know the results of the race and the other major events that happened. You probably were also among those who got star-struck when some Philippine showbiz personalities showed up to join the race or lend support to the loves of their lives. This year, it has been observed that the people of Cebu seem to have accepted the reality that there would be roads that need to be closed so they adjusted their schedules. Some still got irked that they could not do what they want, but they numbers have dwindled as the information about the road closures were made much earlier. There were also some posts on social media about how traffic was managed by the concerned local government units. While Lapu-Lapu City, Mandaue City and Cebu City were able to perform well, not much good has been said about Talisay City. I have a few relatives, who could attest how hard it was to get past Talisay while they did not have problems in Cebu City and the Mandaue area. Participants head to the transition area after the swim. Next year, when Cebu hosts a bigger race, I sincerely hope that whoever will be holding the reins of Talisay City will have better idea on how to ease the flow of traffic not just during the Ironman 70.3, but all throughout the year. Although I am too poor a swimmer and have avoided running on concrete for many years now due to a spine problem, which would not qualify me to be a triathlete, I felt right at home with the crowd at the venue as many were friends or acquaintances and I enjoyed going around the various booths checking out the gear and other stuff that were on sale most specially the muscle tapes that me and my son use a lot. Tim Reed of Australia won the race. Going around the venue, I met many friends who either asked me if I was joining the event or encouraged me to also take up the sport. 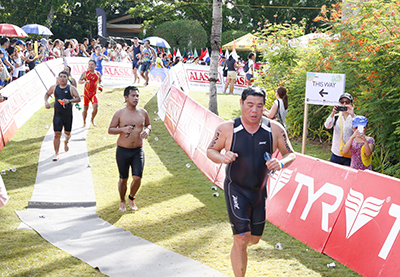 I am sure that more than the economic gains that Cebu reaped during the event, it also served as a catalyst for more people to adopt a healthy lifestyle. A paramedic attends to one of the participants, who collapsed at the finish line. 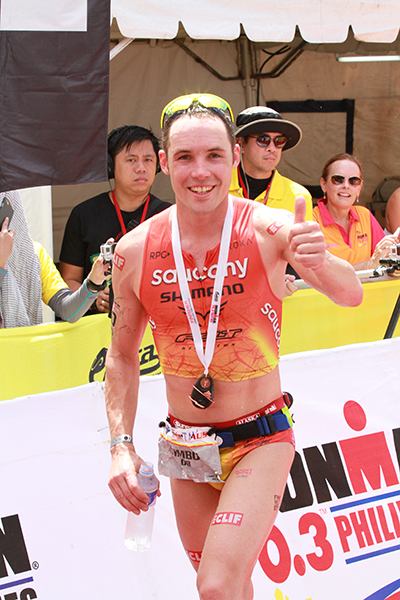 We cannot all be triathletes, but we can all do some exercise.